New York, USA -- TigerLion Works, a Minneapolis-based theatre ensemble, will perform The Buddha Prince in Central Park September 23, 24, 30 and October 1st, and at the Theatre of The Riverside Church on September 26, 27, and 29, concurrent with the Dalai Lama’s visit to New York. Prior to touring to New York City, the play is being performed in Minneapolis September 9 through 13 in Minnehaha Park along the Mississippi River. The Buddha Prince is designed as an outdoor “walking play,” which takes the audience on a journey through nature as the scenes unfold around them. A play for audiences of all ages, The Buddha Prince celebrates the extraordinary life and teachings of His Holiness the 14th Dalai Lama, and is narrated with excerpts from the Dalai Lama’s own teachings and autobiographies. The play covers the Dalai Lama’s early life in a free Tibet to his escape into exile in India. Portrayed by a diverse group of 19 performers, the story is told with a cultural mix of physical theatre and Lecoq-based choreography complemented with live music, dance, mask, puppetry and clown. The Buddha Prince is free to the public when performed outdoors, with a suggested donation. Net proceeds will go to Tibetan relief organizations in each city, including The Tibet Fund in New York City and Tibetan Education Action in Minneapolis. While in New York, the ensemble of performers will also have the opportunity to present The Buddha Prince indoors in association with the Theatre of The Riverside Church. Tickets will be sold for the Theatre performances ($10 per person) and are available at www.ticketweb.com or by calling 212-870-6784. The Theatre of The Riverside Church, located at 91 Claremont Avenue at 120th Street, has long been an important component of the Church. Founded on the belief that the arts can be a transforming power in people’s lives, the 250-seat Theatre has presented a diverse range of programming including original dance productions, film premieres, musicals, and plays. Since its founding in 1960, the Theatre has become well-known for exposing audiences to arts from many cultures, supporting emerging artists of all disciplines and stands as a valuable cultural resource in Upper-Manhattan. Previous presentations have included performances from the Limon Dance Company, the New York Chamber Opera, the Mary Anthony Dance Theater and performances for Riverside Church’s annual New York Family Arts Festival. 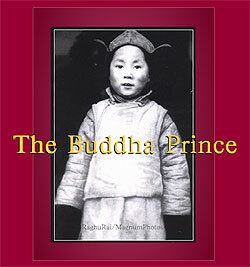 The Buddha Prince is honored and proud to join such noteworthy company. The Buddha Prince has received official endorsement from the Dalai Lama’s Office of Tibet, and is intended to be performed alongside the Dalai Lama’s teaching tours. The play was first presented in celebration of the Dalai Lama’s visit to the Twin Cities in 2001, when it was performed in The Peace Garden in Minneapolis. Since then, the play and score have been further developed and re-mounted at Lower Arroyo Park in Pasadena during the Dalai Lama’s visit to California in April, 2004, by Markell and a team of collaborators, including Co-Producer/Choreographer Tyson Lien (TigerLion Works), Music Director Nina Rolle, and Writers Michael French, Carlyle Coash and Waylon Lewis.